Jose Antonio Dominguez Banderas was born on 10 August 1960, in Malaga Spain. Antonio is one of the most famous actors, producers and directors, perhaps best known for appearing in such films as “Desperado”, “The Mask of Zorro”, “Assassins”, and “Interview with the Vampire”. During his career, Antonio has been nominated for and has won various awards. Some of them include Golden Globe Award, Primetime Emmy Award, European Film Award, Fangoria Chainsaw Award, Goya Award and others. 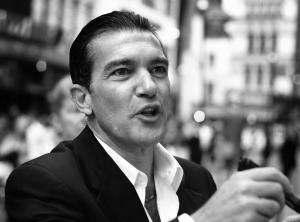 In addition to his acting career, Banderas is also involved in various business activities. Despite the fact, that he is now 54 years old, he still continues his acting career and works on new projects. Undoubtedly, his fans soon will be able to hear more about his new work. So how rich is Antonio Banderas? Sources estimate that Antonio’s net worth is $45 million, the main source of his wealth is, of course, his involvement in various successful movies. Antonio gained this money not only for working as an actor, but as a director as well. What is more, Antonio’s entrepreneurial activities also add to his net worth. If Antonio continues acting for a long time, there is a high chance that this sum of money will only become higher. When Antonio was just a young boy he did not think of himself as an actor: on the contrary, he dreamt about becoming a football player. These dreams shattered when he was 14 years old and experienced an injury. After some time his interest in acting grew and he became a part of the ARA Theatre-School and the College of Dramatic Art. Soon he started performing in various events and plays and even became a part of the Spanish National Theatre. In 1982 Antonio received n invitation to act in the movie called “Labyrinth of Passion”, directed by Pedro Almodovar. Antonio and Almodovar made a great duo, and Antonio appeared in many of his movies, including “Matador”, “Women on the Verge of a Nervous Breakdown” and “Tie Me Up! Tie Me Down!”. In 1991, Antonio appeared in the movie called “Truth or Dare”, which made him popular not only in Spain, but in other parts of the world as well. Soon other directors became aware of Banderas’ talent and began inviting him to play various roles. In 1995 Antonio appeared in the movie “Desperado”, in which he portrayed the main role. During the making of this movie, Antonio had an opportunity to work with such actors as Salma Hayek, Steve Buscemi, Quentin Tarantino, Joaquim de Almeida and others. The success of this movie had a huge impact on the growth of Antonio’s net worth. In 2001 Banderas appeared in the movie entitled “Spy Kids” and its later sequels. Some of his most recent works include, “Take the Lead”, “The Skin I Live In”, “Puss in Boots”, “The Legend of Zorro” among others. All these appearances added to Antonio’s net worth. To talk about Antonio Banderas’ personal life, it can be said that in 1987 Antonio married Ana Leza, but their marriage ended in divorce in 1996, shortly after which Antonio married for the second time, to Melanie Griffith, and the couple has one child. Unfortunately, they divorced in 2015. All in all, Antonio Banderas is a hardworking and talented actor. In order to become famous not only in Spain, but also in other countries, Antonio had to appear in many movies and portray various roles. Now he is one of the most famous Spanish actors and still continues his career. Let’s hope that soon his fans will be able to see him in new movies and that he will also gain acclaim not only as an actor but as director as well. 16 [on films going direct-to-DVD, and the challenges of making Thick as Thieves (2009)] It's funny, because in Spain, it [Thick as Thieves (2009)] was released theatrically and it did very well with practically no promotion at all, competing with big Hollywood movies. And I understand that they're going to open in like 25 countries also, theatrically. But in America, no -- there were offers from studios, I am aware of that because I talked to [Nu Image and Millenium Pictures head] Avi Lerner, but they didn't want to give the money necessary to compete in a theatrical environment in terms of publicity and promotion. But that's the way it goes! That is our world.For me, I joined [the project] very late in the movie; almost 15 days before they started, they called me. And so I had to travel to New York very fast... but for me, the big attraction for accepting the role was Morgan Freeman, to tell you the truth. The possibility of working with an actor that I really admire. He's got a tremendous personality. He's one of those guys that it doesn't matter what he does in front of the camera, he's always interesting because he's got this aura. And then, Mimi Leder became one of my attractions to the project, because she's a woman that has inside more than I have seen in the movies. A couple of movies of hers I really like, and when I saw her working, she's very powerful. There's also a sensitivity coming from women that I love, and I've been directed by women three or four times, in terms of directing actors and managing the entire set. It's very interesting. So all of those elements made it for me. Then, the results are something that you never know what's going to happen, especially in a movie like this -- a genre movie made by an independent company. That is the problem.